I love the comfort foods of fall! By August, when it’s easily 102F in Nashville, I’m ready for cooler weather, football, and fall foods; this is definitely one of my favorites. I put out the call on Twitter for pot roast preparations about a year ago and got some fabulous ideas which I’ve cobbled together here. The flour thickens the juice and really brings everything together; it’s fantastic. 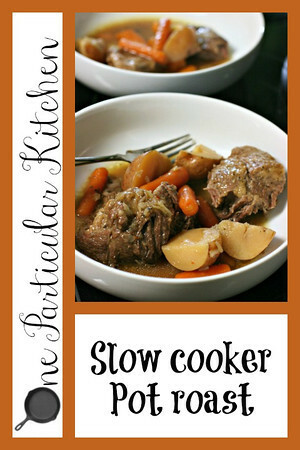 I make it in my combo cooker (affiliate link), but you can also brown in a skillet then move to a slow cooker. Either way, you’ll love it. Your turn! How do YOU do pot roast? Oh girl, you are stealing my heart with Italian dressing mix, ranch dressing mix, and onion soup mix all in one recipe! I love pot roast and I’m totally making this version. And why have I never heard of the combo cooker?! That combo cooker COMPLETES ME. Rice in six minutes. Risotto in ten. And as a pressure cooker it can make this roast in 85 minutes, as tender as all-day slow cooked. You need one! Oh my, Oh my, Oh my. I am totally making this tomorrow. I already have everything and I’m way too excited about this!!! Yay! Yay!! Let me know how you like it! Only 1/2 cup of wine. Does the roast not dry up over the 8hrs? It really doesn’t! Leaner meats can end up dry, but there’s enough fat in a chuck roast that it’s fine. You can always add some beef broth or something if you’re worried, but the 1/2 cup wine has been enough for me.